This sweet, sleepy bunny makes a special bedtime companion for your own little wild thing. 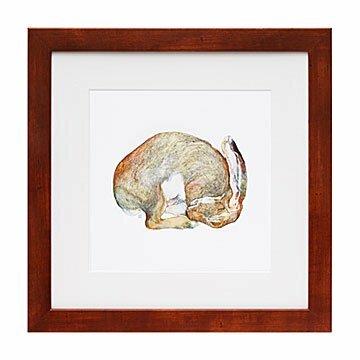 Artist Janie Stapleton was inspired by how animals in the wild only sleep when they feel safe and comfortable, and wanted to inspire those same cozy feelings in human children. Her brushstrokes catch the texture and rich coloring of the rabbit's fur, inviting even the wildest critters to settle down for the night. Artwork made in Arizona. Printed, matted, and framed in Portland, Oregon.